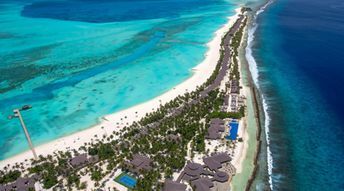 This beach ranks #4 of the "Best islands in the Maldives"
Atmosphere Kanifushi Maldives - A Premium All-Inclusive Resort is a 5 star property (opened in 2013) with room's fares starting from US$600 per night. Considering the choice of free alcohol and food, as well as various activities included in the price, - value for money is the best. However, this is not an upscale resort by the Maldivian standards. But on the other hand, it's not very expensive. Fly to Maldives international airport (MLE). Next, take a seaplane to the island of Kanifushi (half an hour per way, US$700 adult return fare, discounted fares for children are applied). The best time for a beach holiday on the island of Atmosphere Kanifushi is a dry period in the winter half of the year.